When I first heard about the MAC Quite Cute Collection one of the first things I got hyped about was the eyeshadow quad as it looked really fun. I played around with a fair bit late last night and did a look with it this morning, here are my thoughts! Well, not so great I fear. The palette is made up of some really fun Easter Egg shades, it really has a Spring vibe and the pastels just shout Easter to me. Without a doubt it’s a fun arrangement of color that looks rather sweet within the compact and ever so tempting. However, looks are deceiving and upon closer inspection you’ll probably agree that the shades aren’t particularly fabulous for contrasting with unless you’re super creative. I happen to be crazy boring or lack imagination because I couldn’t really think of a great way to use these outside of using the two shades of purple for a contrasting look that I created this morning. Outside the fact that I had a hard time developing a look with the quad the shadow formula is awful. The shades are made up of 50% frost and one satin and one lustre but the formulas are incredibly hard textured and packed very tight so the glide of the formula isn’t smooth nor are the shades pigmented. I thought the best way to use these was with a sponge applicator because trying to attempt a look with an eyeshadow brush will pick up minimal color at the very least a sponge allows for building up a bit easier. 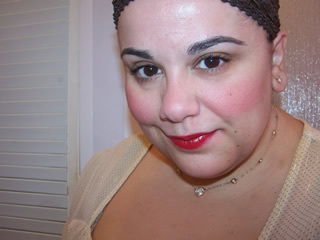 For my look below I simply used Boycrazy all over my lid and Azuki Bean in the crease. These shades pair up well but as I mentioned above I lacked imagination for incorporating the other two colors into the mix. I will say that Goody Good Gum Drop makes a mean color wash. I was pretty shocked at how hard I had to press to see any color pay off, you can see from my swatches the colors all come across very sheer and subtle. If it’s any consolidation the frosts aren’t bad at all and they apply with more of a shimmery finish than a frosty one. If you’re very fair you might be able to work the pastel route however those with medium or darker skin might want to head to counter and swatch this one out before a buy as I think these can prove potentially chalky on darker skin. Overall, the MAC Quite Cute Eyeshadow Quad is adorable in theory but the actually formula is seriously lacking and doesn’t live up to the MAC name at all. Wow Muse…all the shades are gorgeous. You look so pretty!! Boooo! I loved the promo pics but totally passing on this. I can’t understand why Mac keeps putting out shite eyeshadow products. The Tartan Tale sets were the worst… seriously. I know that I personally have stopped buying the eyeshadows because I’m over the lack of color payoff, I can get a palette from Sleek for less than one eyeshadow that is a lot more pigmented. I was going to, but bow that I’ve seen multiple complaints about the texture of the quad, it’s a pass for me. no go carrie, texture is BAD. swatch it and play at your mac counter but I’m going to lean in and say it’s prob a no. I never was a huge fan of this collection because I don’t really like to wear pastels, but you look really nice in your FOTD! you’re too kind emily thanks xoxoxo! Giggly blush is absolutely gorgeous on you! I need 2 to 3 of them I guess! I’m a huge fan of blush and msf and pink colours ahhahahah I’m so happy to be alive! lol nunu you’re too cute ;-D thanks! Muse what do you use lately, your skin seems brighter than before! def dd ;-/ the shades are so easy to fall in love with but the texture is yak! 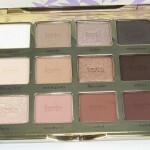 This palette is really deceiving! The colors look amazing and like they would have a nice rich color, but the swatches look really dull. However, I do have to say, the shades do look gorgeous on you! aw brooke thanks you’re way too kind! Thanks a lot for the review. It was on my list, mostly for Azuki Bean and the green-gold colour, but to get a bad colour for one that is nice, not sure. I think I might skip this one and concentrate myself on Chanel summer. me either lately M ;-D wise choice chica! 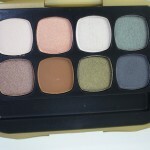 Eeks, reminds me of the Bobbi Brown eyeshadow palettes with shimmer finishes. Pretty bad colour payoff too. aw thanks viki you’re too kind! xoxo! It looks exactly like one of those Lancome GWP tiny eyeshadow palettes. Do you know the ones I’m talking about? Cheapy-cheap.